Sephora VIB Rouge, "a place for people with a serious beauty addiction." A very well described description of this beauty card, since it takes you a whooping $1350 CDN (yearly) to get there. Its takes nothing less than an addiction to get you there (one of which I must say I have). As a past VIB and now a VIB Rouge at Sephora, here are my initial opinions of the welcome package. Though it does offer some awesome benefits such as free shipping, free unlimited makeovers valued at $50 CDN each time, special gifts on random events (so does the VIBs) etc., the welcome kit was very lack luster. Yes its beautiful, with a rich red and black wrapping it screams FABULOUS. However, soon after you are greeted with a small sample size lipstick. Now, I'm not asking for a full size product but I do believe at $1350 they could at least give a bigger sized lippy. It's the regular sized sample lipstick you can get if you redeemed 100 points or on a random day just as a free sample. I guess I should just be happy I got something; but to be frank I would have preferred another 10% discount (the one you get when you get to the VIB level). 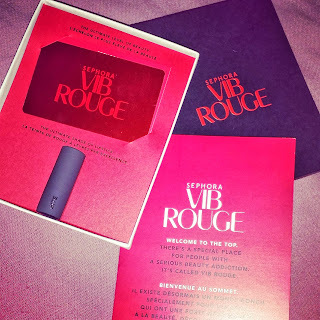 I am yet to sample and review the Bite* custom lipstick created for Sephora VIB Rouge, that came included (coming soon); but it better be darn fantastic all things considering. Will keep you guys updated, with all events to come with this newly reached level. I'm working on the second level! I agree. Additional percentage off. Didn't realize how much is spent a year. Thanks for the review, eloquently written.